ROTA, Spain – A 2017 general equivalency development graduate and Columbus, Ohio, native is serving our country in the Navy, living on the coast of Spain, and participating in a critical NATO ballistic missile defense (BMD) mission while assigned to the guided-missile destroyer USS Carney. Fireman Nichlos Kraft is a gas turbine system technician (electrical) aboard one of the four advanced warships forward-deployed to Rota, Spain, a small village on the country’s southwest coast 65 miles south of the city of Seville. A Navy gas turbine system technician (electrical) is responsible for the maintenance of the gas turbine generators and it’s corresponding switch boards. Kraft credits success in the Navy with lessons learned growing up in Columbus. The ship is named after Adm. Robert Bostwick Carney, who served as Chief of Naval Operations during the Eisenhower administration. Serving in the Navy is a continuing tradition of military service for Kraft, who has military ties with family members who have previously served. Kraft is honored to carry on that family tradition. While serving in the Navy may present many challenges, Kraft has found many great rewards. Kraft is proud of earning an advancement to the rank of fireman apprentice before leaving basic training. Unique experiences build strong fellowship among the crew of more than 300 women and men aboard Carney. Their hard work and professionalism are a testament to the namesake’s dedication and the ship’s motto, “Resolute, Committed, Successful.” The crew is motivated, and can quickly adapt to changing conditions, according to Navy officials. It is a busy life of specialized work, watches and drills. Serving aboard a guided-missile destroyer instills accountability and toughness and fosters initiative and integrity. As a member of one of the U.S. Navy’s most relied upon assets, Kraft and other Carney sailors know they are a part of a legacy that will last beyond their lifetimes providing the Navy the nation needs. ROTA, Spain – A 2012 Houston Academy for Internation Studies graduate and Houston native is serving our country in the Navy, living on the coast of Spain, and participating in a critical NATO ballistic missile defense (BMD) mission while assigned to the guided-missile destroyer USS Carney. Petty Officer 3rd Class Cordell Baham is a yeoman aboard one of the four advanced warships forward-deployed to Rota, Spain, a small village on the country’s southwest coast 65 miles south of the city of Seville. A Navy yeoman is responsible for clerical duties, to write and revise several directives and instructions. Baham credits success in the Navy with lessons learned growing up in Houston. “My father knew after college I needed somewhere to assert my skills so he suggested the Navy,” said Baham. While serving in the Navy may present many challenges, Baham has found many great rewards. Baham is proud of advancing to the rank of petty officer third class. As a member of one of the U.S. Navy’s most relied upon assets, Baham and other Carney sailors know they are a part of a legacy that will last beyond their lifetimes providing the Navy the nation needs. ROTA, Spain – A 2013 Pensaola Collegiate High School graduate and Jacksonville, Florida, native is serving our country in the Navy, living on the coast of Spain, and participating in a critical NATO ballistic missile defense (BMD) mission while assigned to the guided-missile destroyer USS Carney. Petty Officer 2nd Class Kayla Bowens is a cryptological technical technician aboard one of the four advanced warships forward-deployed to Rota, Spain, a small village on the country’s southwest coast 65 miles south of the city of Seville. A Navy cryptological technical technician is responsible for the ship’s defense by working with intelligence to help leaders make tactical decisions. Bowens credits success in the Navy with lessons learned growing up in Jacksonville. Serving in the Navy is a continuing tradition of military service for Bowens, who has military ties with family members who have previously served. Bowens is honored to carry on that family tradition. While serving in the Navy may present many challenges, Bowens has found many great rewards. Bowens is proud of earning a meritorius advacement to petty officer second class in 2017 at her last command. She has also earned her Information Warfare and Air Warfare qualification pins and is currently working toward her Enlisted Surface Warfare Specialist qualification. As a member of one of the U.S. Navy’s most relied upon assets, Bowens and other Carney sailors know they are a part of a legacy that will last beyond their lifetimes providing the Navy the nation needs. ROTA, Spain – A 2010 Armiso High School graduate and Suisun City, Louisiana, native is serving our country in the Navy, living on the coast of Spain, and participating in a critical NATO ballistic missile defense (BMD) mission while assigned to the guided-missile destroyer USS Carney. Lt. Zachary Braida is an anti-submarine warfare officer aboard one of the four advanced warships forward-deployed to Rota, Spain, a small village on the country’s southwest coast 65 miles south of the city of Seville. A Navy anti-submarine warfare officer is responsible for anti-submarine warfare mission area and the sonar technicians in the combat acoustics division. Braida credits success in the Navy with lessons learned growing up in Suisun City. “I have learned to work hard, never quit and to treat others the way you want to be treated,” said Braida. Serving in the Navy is a continuing tradition of military service for Braida, who has military ties with family members who have previously served. Braida is honored to carry on that family tradition. While serving in the Navy may present many challenges, Braida has found many great rewards. Braida is proud of earning the title of division officer and leading the outstanding sailors in his division. As a member of one of the U.S. Navy’s most relied upon assets, Braida and other Carney sailors know they are a part of a legacy that will last beyond their lifetimes providing the Navy the nation needs. ROTA, Spain – A 2014 Rison High School graduate and New Edinburg, Arizona, native is serving our country in the Navy, living on the coast of Spain, and participating in a critical NATO ballistic missile defense (BMD) mission while assigned to the guided-missile destroyer USS Carney. Petty Officer 2nd Class Jokenzie Broughton is a gunner’s mate aboard one of the four advanced warships forward-deployed to Rota, Spain, a small village on the country’s southwest coast 65 miles south of the city of Seville. A Navy gunner’s mate is responsible for for the upkeep of the MK41 vertical launching system and the operation and maintenance of the small arms and crew-served weapons on board. Broughton credits success in the Navy with lessons learned growing up in New Edinburg. Serving in the Navy is a continuing tradition of military service for Broughton, who has military ties with family members who have previously served. Broughton is honored to carry on that family tradition. While serving in the Navy may present many challenges, Broughton has found many great rewards. Broughton is proud of earning a nomination for Junior Sailor of the Quarter. He received praise for his leadership and the accomplishments of the team. As a member of one of the U.S. Navy’s most relied upon assets, Broughton and other Carney sailors know they are a part of a legacy that will last beyond their lifetimes providing the Navy the nation needs. ROTA, Spain – A 2010 Bozeman High School graduate and Panama City, Florida, native is serving our country in the Navy, living on the coast of Spain, and participating in a critical NATO ballistic missile defense (BMD) mission while assigned to the guided-missile destroyer USS Carney. Petty Officer 2nd Class Kyle Brown is a gas turbine systems technician (electrical) aboard one of the four advanced warships forward-deployed to Rota, Spain, a small village on the country’s southwest coast 65 miles south of the city of Seville. A Navy gas turbine systems technician (electrical) is responsible for the operation and maintenance of gas turbine engines that drive the ship. Brown credits success in the Navy with lessons learned growing up in Panama City. “Being in the water so much and working for a local dive shop prepared me to be a Search and Rescue Swimmer,” said Brown. Serving in the Navy is a continuing tradition of military service for Brown, who has military ties with family members who have previously served. Brown is honored to carry on that family tradition. While serving in the Navy may present many challenges, Brown has found many great rewards. Brown is proud of earning his achievement of becoming a search and rescue swimmer. The preparation and dedication to the certification paid off when he earned the SAR certification. As a member of one of the U.S. Navy’s most relied upon assets, Brown and other Carney sailors know they are a part of a legacy that will last beyond their lifetimes providing the Navy the nation needs. ROTA, Spain – A 2009 Norristown Area High School graduate and Norristown, Pennsylvania, native is serving our country in the Navy, living on the coast of Spain, and participating in a critical NATO ballistic missile defense (BMD) mission while assigned to the guided-missile destroyer USS Carney. Petty Officer 2nd Class Rasahn Clark is a quartermaster aboard one of the four advanced warships forward-deployed to Rota, Spain, a small village on the country’s southwest coast 65 miles south of the city of Seville. A Navy quartermaster is responsible for safe navigation of the ship. Clark credits success in the Navy with lessons learned growing up in Norristown. Serving in the Navy is a continuing tradition of military service for Clark, who has military ties with family members who have previously served. Clark is honored to carry on that family tradition. While serving in the Navy may present many challenges, Clark has found many great rewards. Clark is proud of earning a Navy and Marine Corps Acheivement Medal for receiving the highest score on the ship during an inspection. As a member of one of the U.S. Navy’s most relied upon assets, Clark and other Carney sailors know they are a part of a legacy that will last beyond their lifetimes providing the Navy the nation needs. “Serving in the Navy has taught me to have patience and always remain professional,” said Clark. ROTA, Spain – A 1997 Dana Hills High School graduate and Dana Point, California, native is serving our country in the Navy, living on the coast of Spain, and participating in a critical NATO ballistic missile defense (BMD) mission while assigned to the guided-missile destroyer USS Carney. Command Master Chief David Marcus is the command master chief aboard one of the four advanced warships forward-deployed to Rota, Spain, a small village on the country’s southwest coast 65 miles south of the city of Seville. A Navy command master chief is responsible for the care and feeding of sailors, enlisted and officers, as well as the commanding officer’s liaison to the enlisted personnel onboard. Marcus credits success in the Navy with lessons learned growing up in Dana Point. “Growing up in southern California, my dad taught me to have a hard work ethic and if it’s not broke, break and make it better, and I’ve applied that to my Navy career,” said Marcus. Serving in the Navy is a continuing tradition of military service for Marcus, who has military ties with family members who have previously served. Marcus is honored to carry on that family tradition. While serving in the Navy may present many challenges, Marcus has found many great rewards. Marcus is proud of earning the first west coast Battle “E” aboard USS Theodore Roosevelt. As a member of one of the U.S. Navy’s most relied upon assets, Marcus and other Carney sailors know they are a part of a legacy that will last beyond their lifetimes providing the Navy the nation needs. ROTA, Spain – A 2000 University of Houston graduate and Pasadena, Texas, native is serving our country in the Navy, living on the coast of Spain, and participating in a critical NATO ballistic missile defense (BMD) mission while assigned to the guided-missile destroyer USS Carney. Cmdr. Tyson Young is a commanding officer aboard one of the four advanced warships forward-deployed to Rota, Spain, a small village on the country’s southwest coast 65 miles south of the city of Seville. A Navy commanding officer is responsible for the command of ‘505 feet of American fighting steel’ within the U.S. 6th fleet area of operations and the care of her 325 sailors on board. Serving in the Navy is a continuing tradition of military service for Young, who has military ties with family members who have previously served. Young is honored to carry on that family tradition. While serving in the Navy may present many challenges, Young has found many great rewards. Young is proud of the opportunity to command and lead the sailors onboard the Carney. The privilige to lead sailors is very fulfilling, he said. 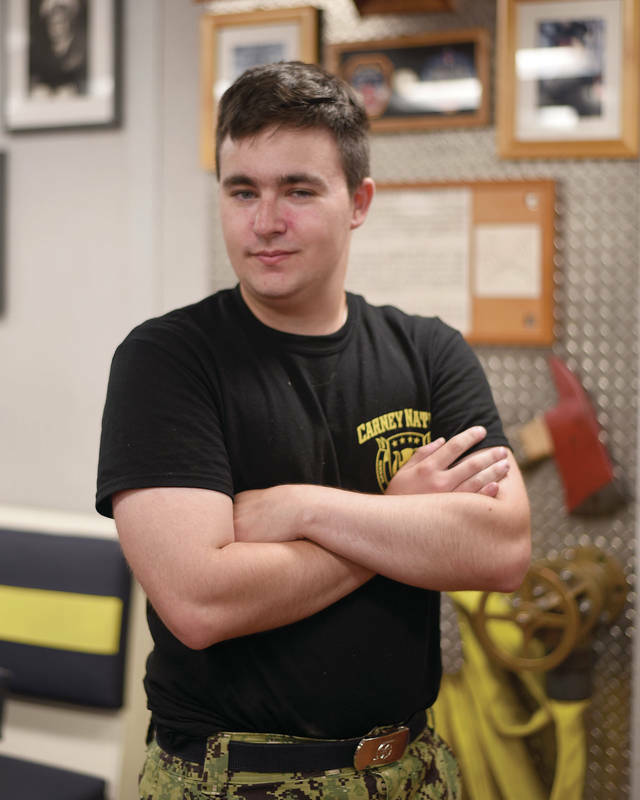 As a member of one of the U.S. Navy’s most relied upon assets, Young and other Carney sailors know they are a part of a legacy that will last beyond their lifetimes providing the Navy the nation needs. ROTA, Spain – A 2014 LaPine High School graduate and LaPine, Oregon, native is serving our country in the Navy, living on the coast of Spain, and participating in a critical NATO ballistic missile defense (BMD) mission while assigned to the guided-missile destroyer USS Carney. Petty Officer 3rd Class Mkenzie Conard is a hospital corpsman aboard one of the four advanced warships forward-deployed to Rota, Spain, a small village on the country’s southwest coast 65 miles south of the city of Seville. A Navy hospital corpsman is responsible for shipboard medical readiness, immunizations, sick call in addition to special physicals for sailors. Conard credits success in the Navy with lessons learned growing up in LaPine. Serving in the Navy is a continuing tradition of military service for Conard, who has military ties with family members who have previously served. Conard is honored to carry on that family tradition. While serving in the Navy may present many challenges, Conard has found many great rewards. Conard is proud of earning a Joint Service Achievement Medal for efforts while working in neonatal intensive care unit. As a member of one of the U.S. Navy’s most relied upon assets, Conard and other Carney sailors know they are a part of a legacy that will last beyond their lifetimes providing the Navy the nation needs. ROTA, Spain – A 2009 Kamiakin High School graduate and Kennewick, Washington, native is serving our country in the Navy, living on the coast of Spain, and participating in a critical NATO ballistic missile defense (BMD) mission while assigned to the guided-missile destroyer USS Carney. Petty Officer 2nd Class Garrett Cook is a culinary specialist aboard one of the four advanced warships forward-deployed to Rota, Spain, a small village on the country’s southwest coast 65 miles south of the city of Seville. A Navy culinary specialist is responsible for the morale of the crew by providing three healthy and tasty meals a day. They also inventory and order supplies for the ship’s galley. Cook credits success in the Navy with lessons learned growing up in Kennewick. “Back home, I attended a culinary arts program which gave me a definite edge when it comes to cooking in the Navy,” said Cook. Serving in the Navy is a continuing tradition of military service for Cook, who has military ties with family members who have previously served. Cook is honored to carry on that family tradition. While serving in the Navy may present many challenges, Cook has found many great rewards. Cook is proud of earning a position on the USNS Mercy hospital ship, which provided humanitarian aid to five Southwest Asian countries. As a member of one of the U.S. Navy’s most relied upon assets, Cook and other Carney sailors know they are a part of a legacy that will last beyond their lifetimes providing the Navy the nation needs.